ADF has been designated a hate group by the Southern Poverty Law Center (SPLC) for its anti-LGBT agenda which includes advocating for state-sanctioned sterilization of transgender people. 17-year-old Drew Adams, a transgender boy, is suing the St. John's County Florida school board to use gender appropriate bathrooms. The kid peeing in the boys' room has end-of-world consequences. Ugh. Showing up as expert witnesses in the case are Dr. Paul Hruz and Dr. Allan M. Josephson. Hruz, an endocrinologist, specializes in diabetes. He has never treated an adolescent with gender dysphoria and is at odds with his own professional organization, the Endocrine Society. Dr. Hruz is an Associate Professor of Pediatrics in the Division of Pediatric Endocrinology and Diabetes at Washington University School of Medicine in St. Louis. He is proffered as an expert witness based on his study of “existing literature related to the incidence, potential etiology and treatment of gender dysphoria.” … Translated, it appears to mean that he has read some things about it. Dr. Hruz admits that he has not treated any transgender patients, patients with gender dysphoria, conducted peer-reviewed research about gender identity, transgender people, or gender dysphoria; and is not a psychiatrist, a psychologist, nor mental health care provider of any kind, who could speak knowledgeably about the effects of Defendant’s discriminatory policy on transgender students, let alone Plaintiff. Similarly, Dr. Josephson admitted in court that he is not an expert in treating transgender patients or in treating patients with gender dysphoria and that he has not developed any expertise in the issues that are presented in this case. Indeed, Josephson advocates for reparative therapy (lower third of the post). In forty-one years, Dr. Josephson has never published a study analyzing transgender identity or healthcare, or gender dysphoria, has not been engaged in any peer-reviewed analyses in these areas and has not engaged in any scientific studies in this area including any research on related topics. Dr. Josephson has never given a presentation on transgender identity or gender dysphoria in any serious medical or scientific setting. He has never undertaken any coursework to better understand transgender healthcare issues, never been a part of any of the professional organizations that promulgate standards of care for transgender healthcare, and (unlike his colleagues at University of Louisville) he does not list LGBT healthcare as an area of interest or specialty. Dr. Josephson does not teach any courses to medical students regarding LGBT care, though his colleagues do. Dr. Hruz has served as an expert witness in some of the same cases in which Dr. Josephson has also served. Dr. Hruz and Dr. Josephson first met and became experts for school districts that discriminate against transgender children at a conference sponsored by the Alliance Defending Freedom. The two also showed up for a rigged panel discussion moderated by Ryan T. Anderson at Heritage Foundation. 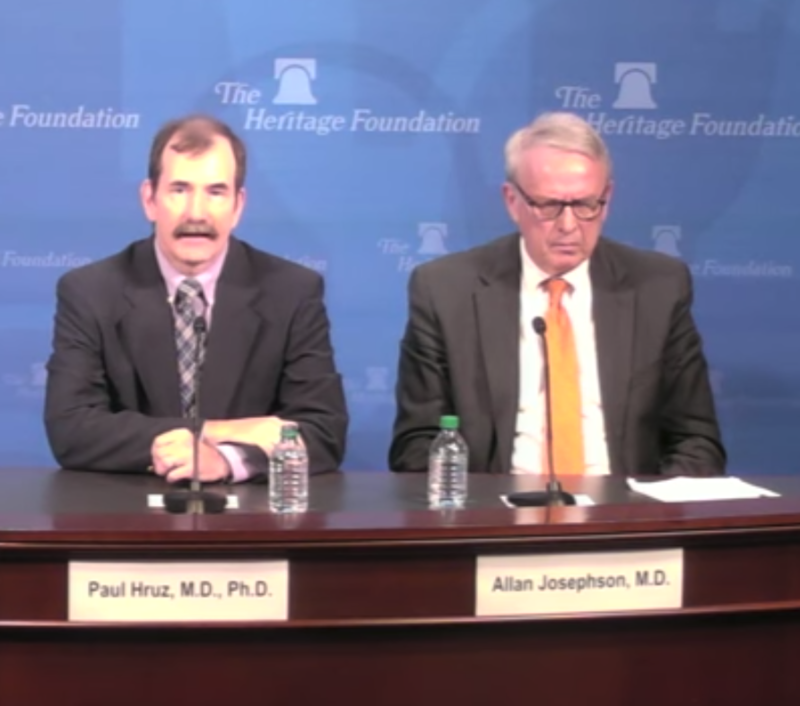 Dr. Paul Hruz (L) and Dr. Allan Josephson (R) - Part of an anti-LGBT panel at the conservative Heritage Foundation. Another road warrior in this case is R. Christopher Barden, a well known lawyer from Minnesota (JD, Harvard) who also has a PhD in psychology. Barden is one of the attorneys for the school board. He seems an unlikely participant. The most important part of this is that ADF is determined to undermine any rights that LGBT kids might have. They show a complete disregard for the well-being of children, particularly trans kids. They need no help from ADF to be marginalized and vulnerable. ADF's interests are limited to having the world conform to conservative Christian principles based on those all-too-familiar ancient chronicles. Accordingly, gender affirmation is not part of God's plan. This post first appeared at David Cary Hart's The Slowly Boiled Frog and appears here with his permission.